Are you interested in an editing and publishing career or being a published author? Are you interested in how science fiction and fantasy publishing compares to literary fiction? Do you want to read about ghosts, aliens, robots, and small towns? Then save the date for March 18th, 4-6pm (the day after spring break) in ENG2 102. We have a multipart event with Micah Hicks, UCF faculty member and author of Break the Bodies, Haunt the Bones, and Editor Extraordinaire John Joseph Adams, who has his own publishing imprint with Houghton Mifflin Harcourt, edits the seminal prize anthology for science fiction and fantasy, and edits one of the top science fiction and fantasy literary journals, Lightspeed. 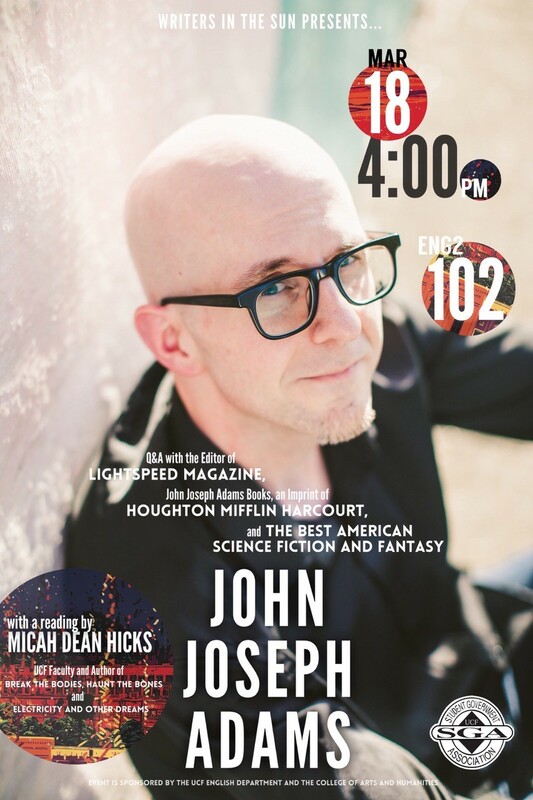 Micah Hicks will read from his new book, which was edited by John Joseph Adams, and then they will have a public conversation about the editing of the book and the editing and publishing world in general, as well as an audience Q&A. Come with questions or just to listen. 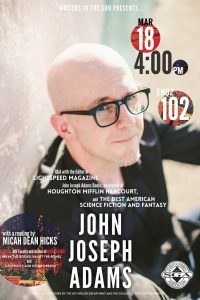 A UCF alum, John Joseph Adams is the editor of John Joseph Adams Books, a science fiction and fantasy imprint from Houghton Mifflin Harcourt. He is also the series editor of Best American Science Fiction and Fantasy, as well as the bestselling editor of more than thirty anthologies, including Wastelands and The Living Dead. Recent books include Cosmic Powers, What the #@&% Is That?, Operation Arcana, Press Start to Play, Loosed Upon the World, and The Apocalypse Triptych. Called “the reigning king of the anthology world” by Barnes & Noble, John is a two-time winner of the Hugo Award (for which he has been a finalist twelve times) and an eight-time World Fantasy Award finalist. John is also the editor and publisher of the digital magazines Lightspeed and Nightmare, and is a producer for WIRED’s The Geek’s Guide to the Galaxy podcast. He also served as a judge for the 2015 National Book Award. Micah Dean Hicks is the Calvino Prize-winning author of the novel Break the Bodies, Haunt the Bones, a social commentary on small town America, in which a dying town already full of ghosts receives new visitors: pig people, robots, and aliens, and one haunted family must escape before the town is torn apart by violence. He is also the author of Electricity and Other Dreams, a collection of dark fairy tales and fables. His writing has appeared in The New York Times, The Kenyon Review, Epoch, Chicago Tribune, and elsewhere. He teaches creative writing at the University of Central Florida.